Apart from bananas, what other fruits and vegetables contain the cool-sounding phytonutrient delphinidin? I don’t want to assume white just because it is bananas. In light of your post about specific vegetable servings, what are examples of orange vegetables, besides carrots? 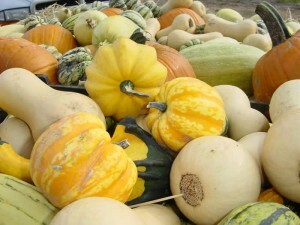 Do sweet potatoes or winter squash count? Brandon: Delphinidin, which has been studied extensively and shown to be a powerful chemopreventive phytonutrient (meaning it is quite powerful at squashing tumor cells), is also prevalent in blackberries, blueberries, cranberries, elderberries, raspberries, and strawberries. Start your day off with a blueberry-banana-strawberry shake and you’ll get your delphinidin on!